Free UPS Ground on Order - including the staples if bought with the tool! 1 year Bostitch limited warranty. 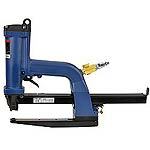 Bostitch P51-5B pneumatic plier stapler. New version of Bostitch P50-5B. Uses SB5019 Bostitch interchange staples, 1/4" - 5/8". Similar to Salco SP50-5B. SB5019 1/4", 3/8", 1/2", 5/8"